We are pleased to announce the availability of the Controlled Motion™ mechanism. The minimalist, symmetrical design enhances the aesthetic appearance of the Controlled Motion mechanism. It is ideally recommended when customers want seating solutions with fewer paddles. 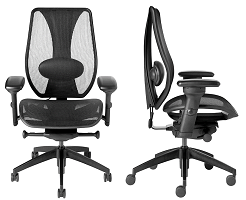 Available on the tCentric Hybrid and airCentric chair series.